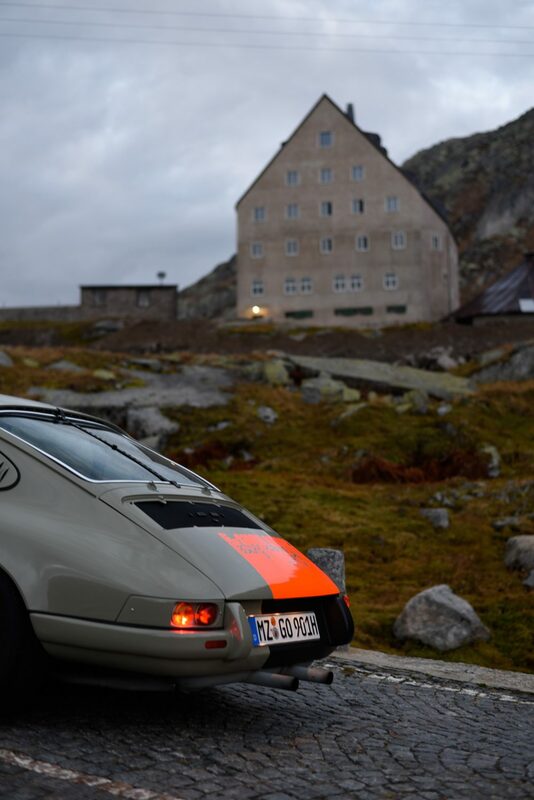 The tale of how this particular Porsche came to be has already been told, but the full story still has plenty of blank pages left to be filled. 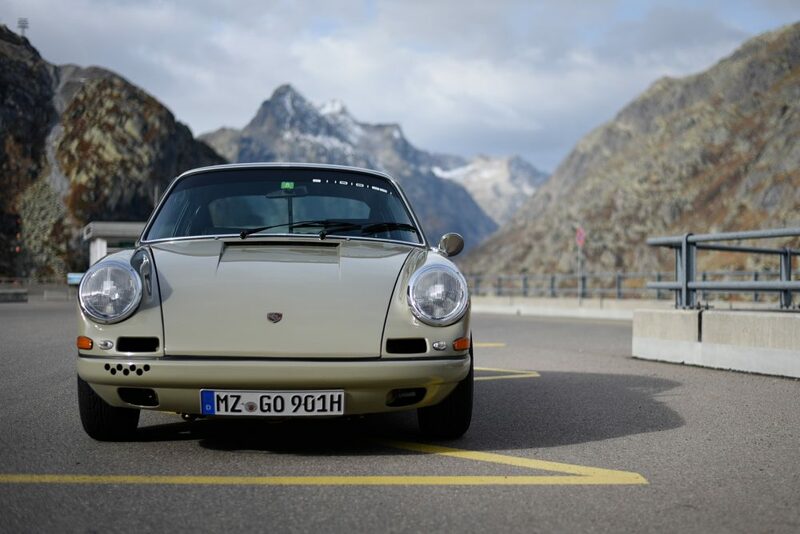 If you don’t have time to read about the transformation that brought the car to where it is today, the gist is this: serial number 9110101621 began as a crusty example of a neglected 911, and over the course of two years I worked with my favorite mechanics to transform it into the vision I’d had in mind and sketched on the pages of notebooks for almost half a decade. 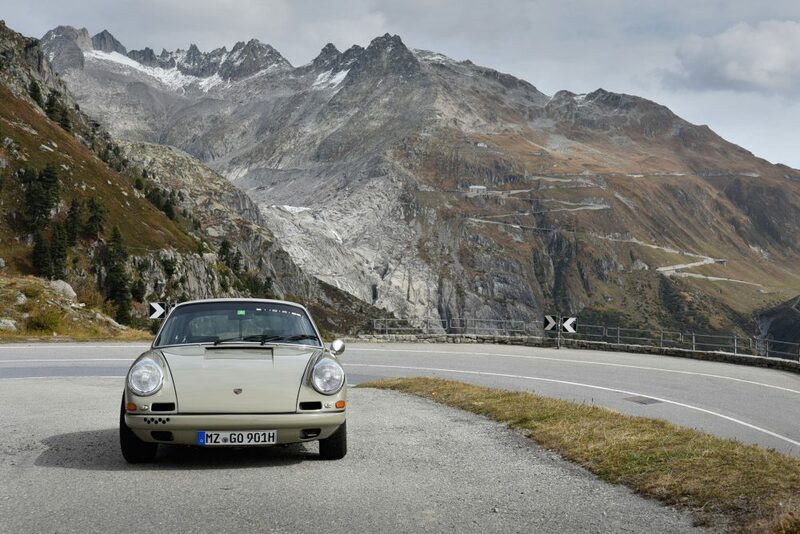 The car was finally reborn and ready to be enjoyed at the beginning of September, and since I’d spent so much time waiting patiently for this moment to arrive, I already had my first big drive with the car mapped out: I would make a trip with my girlfriend into the Swiss Alps! An unexpected defect in the clutch put this plan on hold momentarily, and so worry entered the equation: the possibility of further delays could leave us unable to take the journey this year, as by the time winter rolls around and starts dumping snow on the peaks many of the alpine passes are closed, often for months at a time. 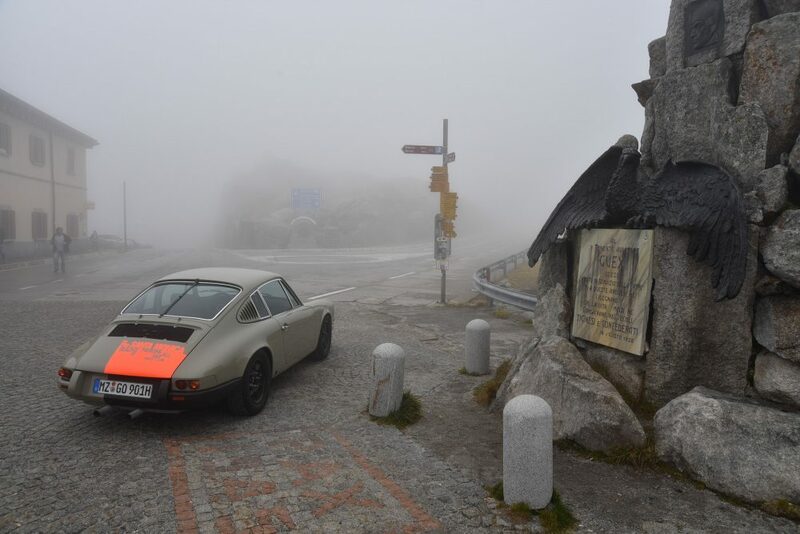 Thankfully the clutch was sorted in a matter of days, and everything else was performing as it should be, so we set off out of the city and started our climb into the clouds. 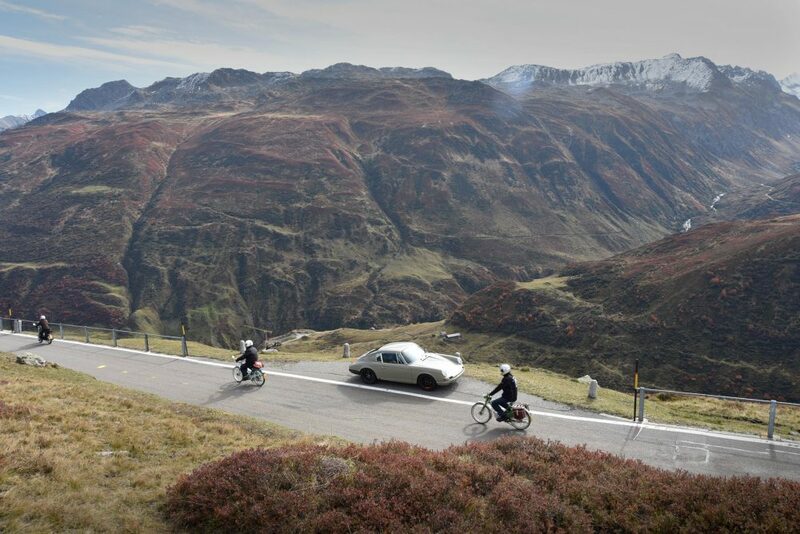 We were having a great time even before we hit anything steep though, and on the well-paved highway we chose to take us out of Germany I had some space to stretch out the motor and leave the throttle open. At just a scant 130km/h the flat-six is already quite the noisy companion, and surging up to 180 turns the sound downright infernal. I didn’t keep pushing though, as this was the first major shakedown after all, and we still had plenty of ground to cover. 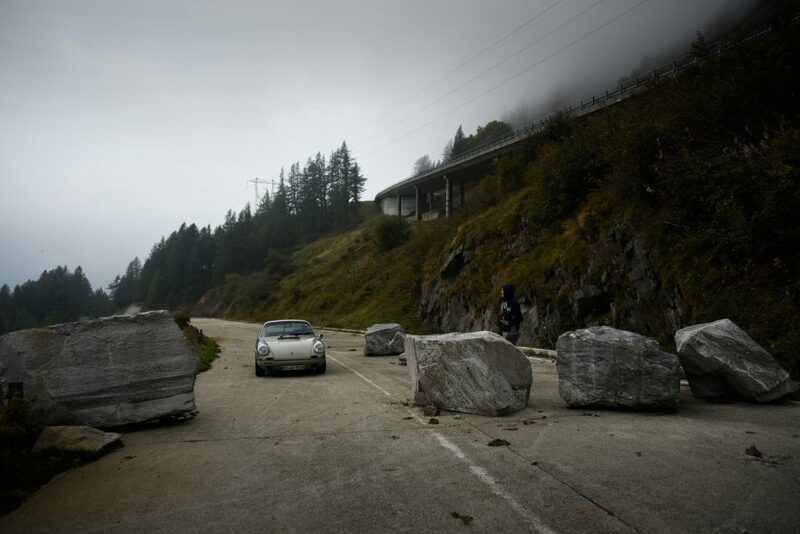 And by the time we crossed into Switzerland, there was also plenty of ground to go underneath. 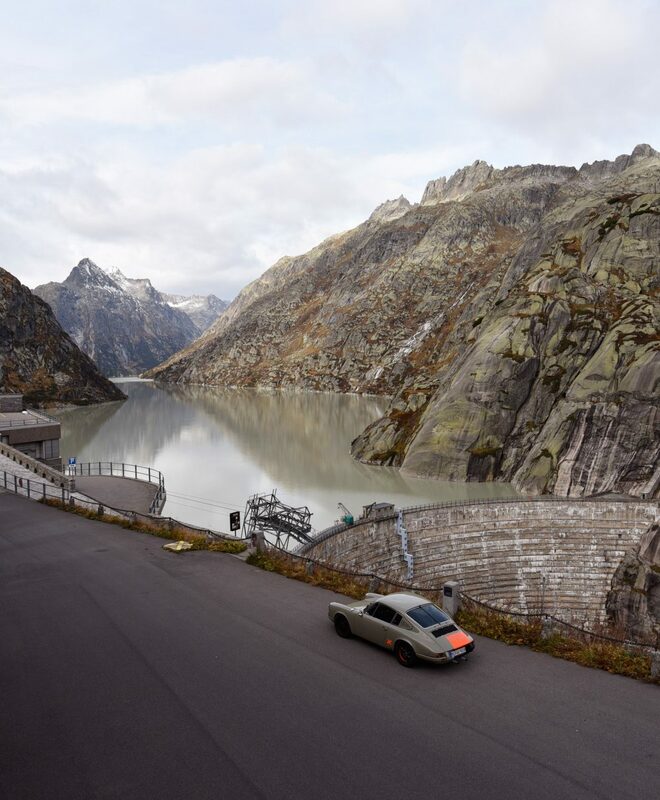 The Swiss topography has made adept engineers out of the people tasked with building roads in the country, and the countless bridges and tunnels and narrow highways cut into the side of cliff faces never fail to impress. 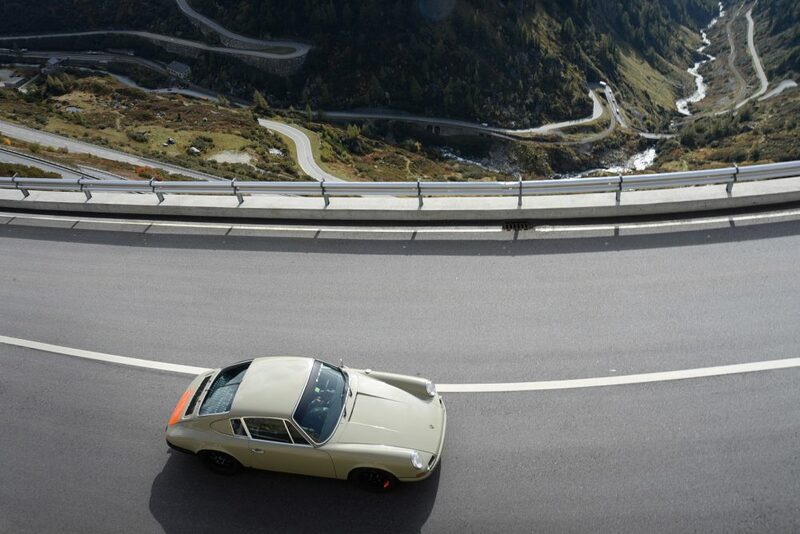 Besides, all those multi-km-long tunnels offer a great chance to really get silly with the exhaust. 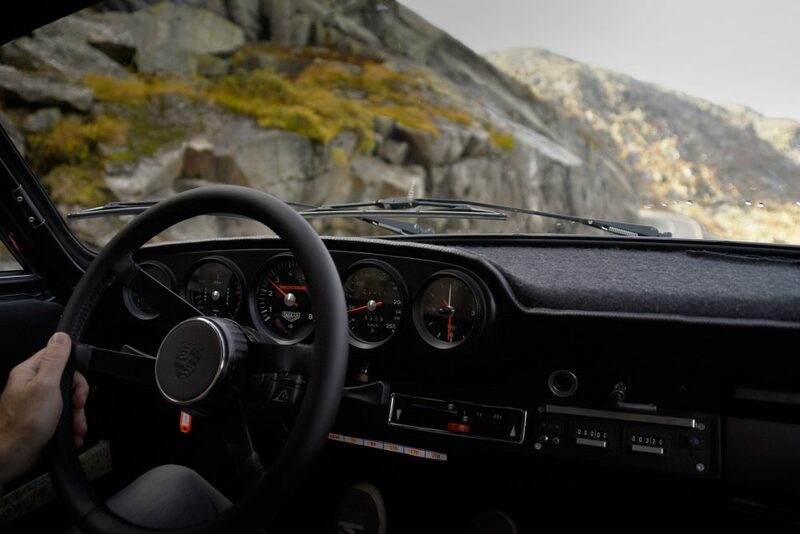 I did my best to let the tach approach the red and the resulting sound likely shook a few pieces of plaster from the cylindrical walls of more than a few of these tunnels. 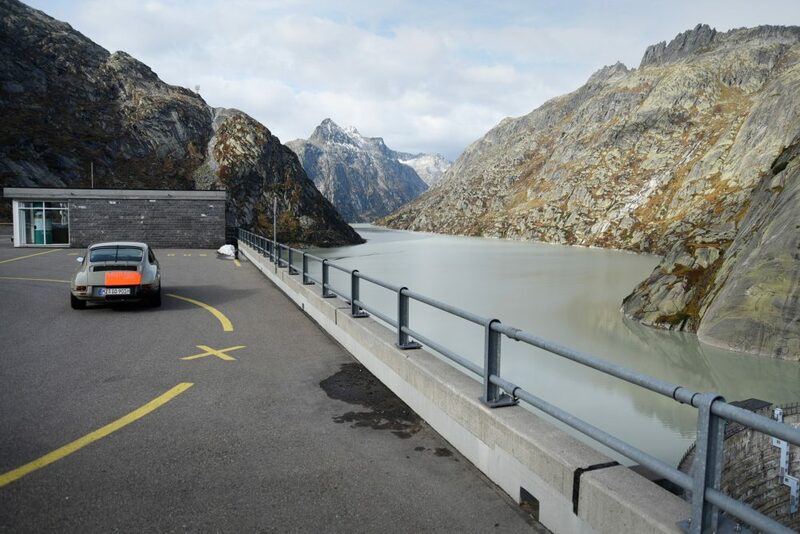 We followed our route past Basel and Lucerne, and though we did have some good fun like the aforementioned tunnel runs, I was very careful to obey the strict speed limits in the country. I did not want to sully the trip with a speeding ticket earned so early on. 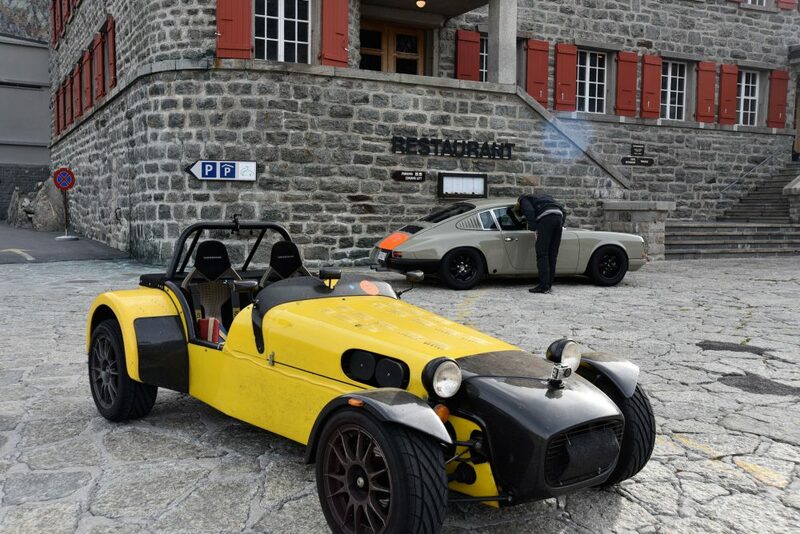 We met up with the driver of a Lotus Super 7 a few days after he’d paid one for 2,000CHF (that’s a bit more than 2,000USD)! So, we didn’t make the same kind of time as we would have without these pesky speed cameras, but it allowed us to marvel at the scenery moving by our windows at a reduced pace, so it wasn’t all bad. 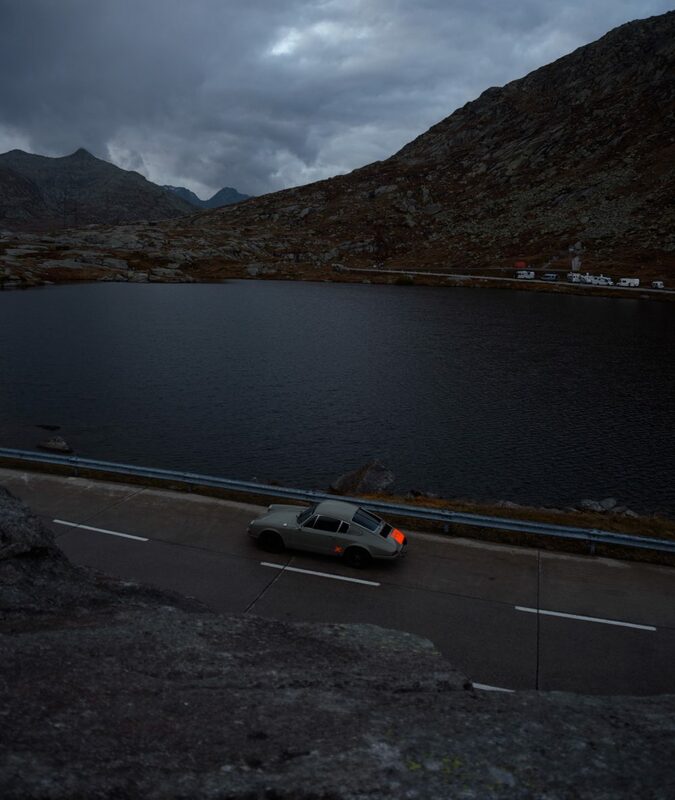 Like I said though, we weren’t moving along all that fast, and so it was under the blanket of night that we swung the headlights onto our first hotel: the Grimsel Hospiz. 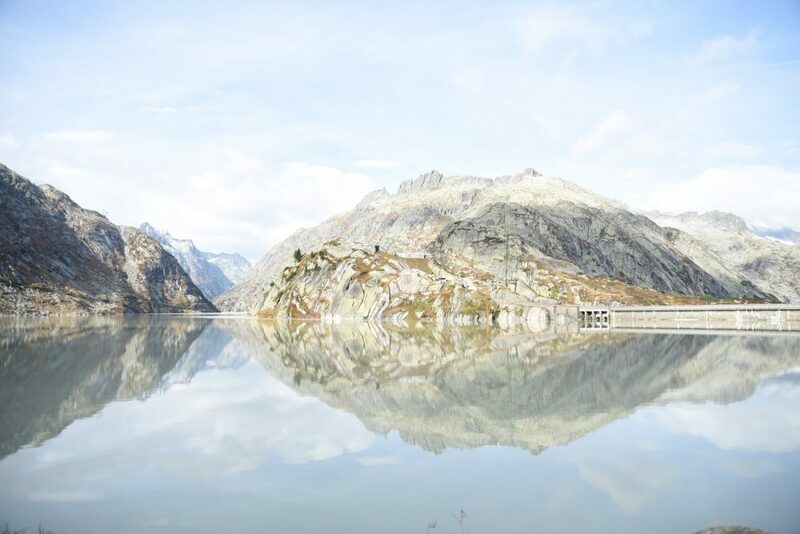 Perched idyllically and ideally on a massive wedge of rock, the hotel is situated next to a reservoir dam at an altitude of roughly 2,000 meters. 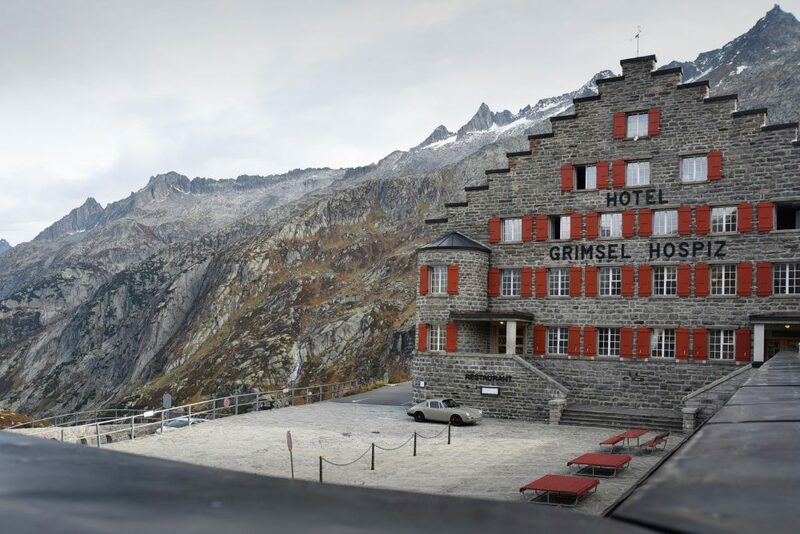 It has a neat history too: 900 years ago, this was the first certified guest house/hotel in Switzerland, and apparently, in 1932, it was the first residential building in Europe to be fitted with electric heat. I am not an expert in the history of warming up winter homes, but I am inclined to take their word for it! After taking a look around the area and a rejuvenating meal, we were off to bed with a big day to arrive the following morning. 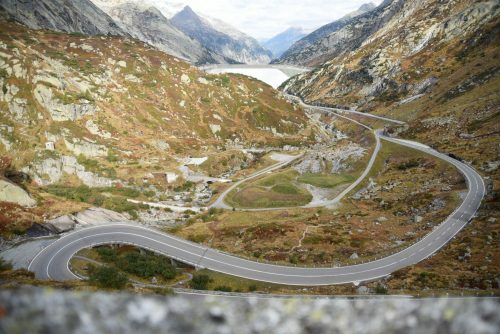 Did I mention that the road leading to Grimsel Hospiz was a 38km-long scribble of exciting apexes? We awoke in our mountain abode as the sun lifted itself over the peaks, and got on with it right away. 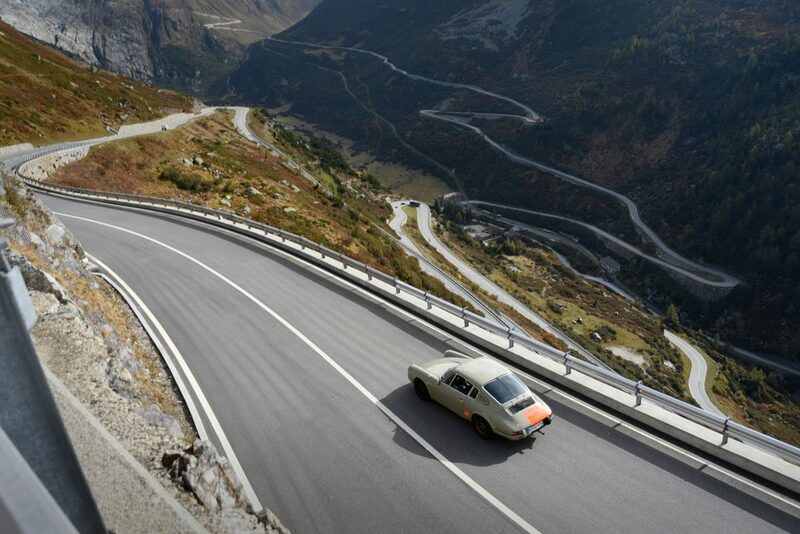 We began by taking photos all around this wonderful stretch of tarmac, and in this location the car looked perfect. 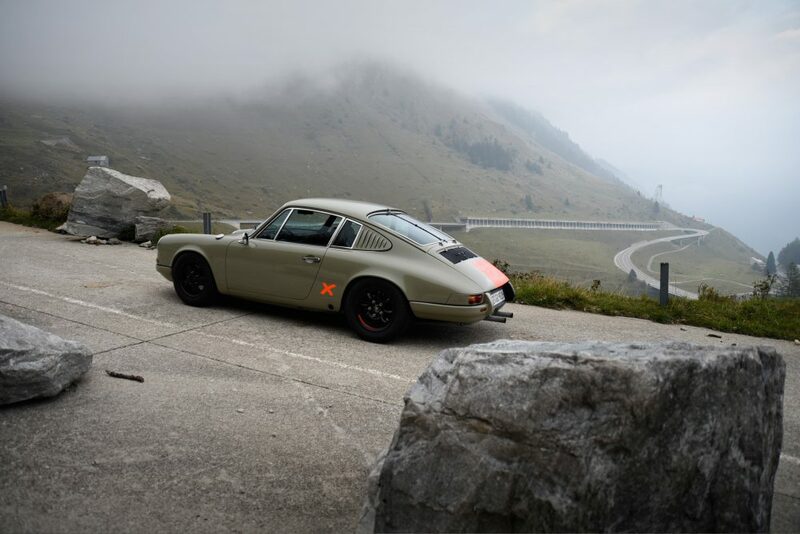 From some angles the Porsche would take on a chameleon aspect to its paint, as the stone grey color is very similar to that of the mountains surrounding it, and it reflected the grass and sky and water in some intriguing ways depending on which angle we were viewing it from. 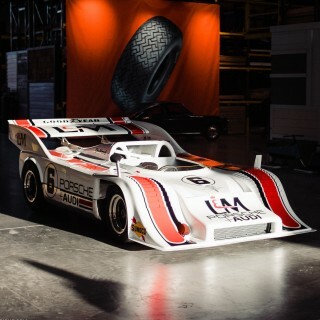 The patch of color on the bonnet is still my favorite piece of the paintwork though, and it just so happens that the rear end of the Porsche is the most interesting half of the car, besides being the prettiest in my opinion! The juxtaposition of the Santa Monica beach parking design with the jagged snow-dusted mountains was not lost on me either. 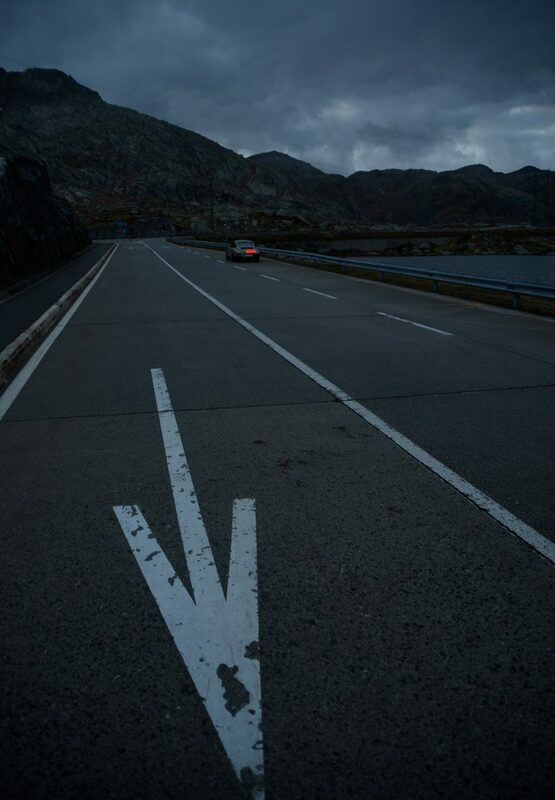 As for the moving portion of the day, we had a route in mind that would take us across 270km of sublime driving. 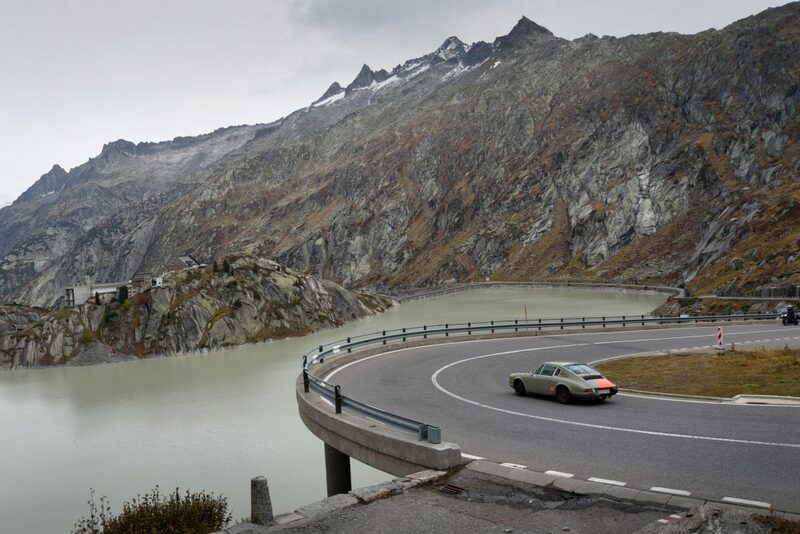 The weather couldn’t have been better, and it was with giddy anticipation that we fastened our four-point harnesses, a procedure that takes enough time in normal conditions, let alone when you fingers are jittering with adrenaline and excitement. 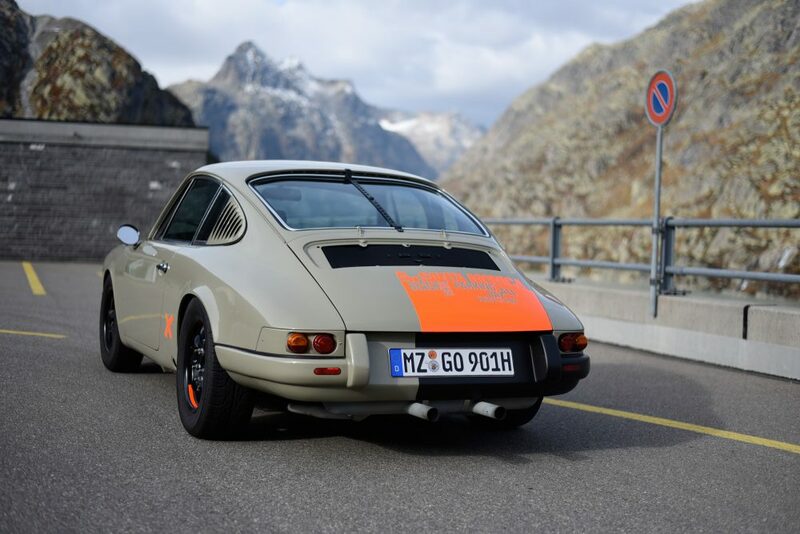 We set off southbound, taking the Grimsel Pass down to Gletsch, and then the plan was to go over the Simplon Pass toward Italy. Along the way we were rarely alone, even all the way up here, as at each stop we attracted a gaggle of onlookers to the car, and along the way our noise startled more than a few hikers used to the silence that preceded us. The street surface is perfect here, and it’s the kind of smooth that urges you to go faster regardless of however fast you’re already going. 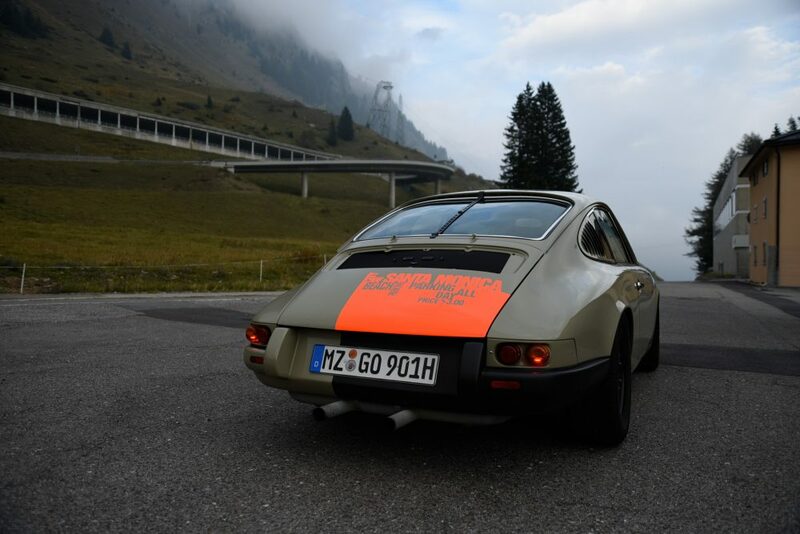 In our case though, we still needed to tune the carburetors in general, and the high altitude wasn’t doing our engine any favors in the power department, so we didn’t quite careen as much as we cruised. 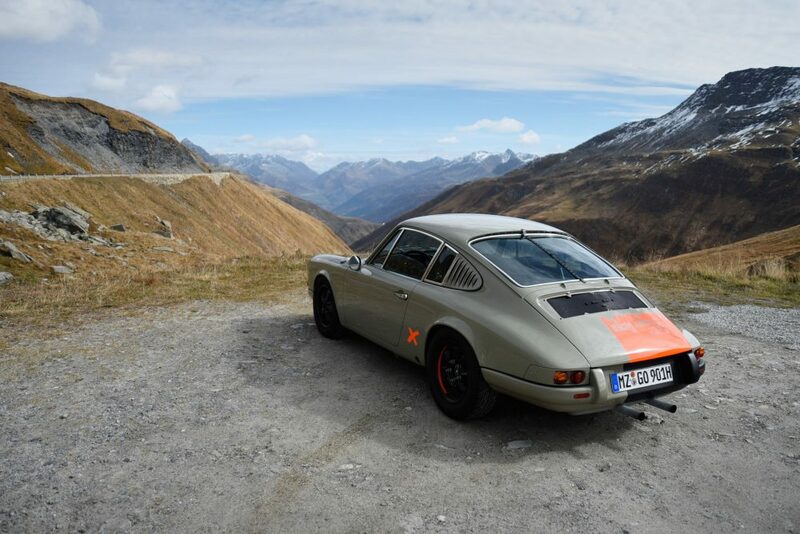 Still, I gave the suspension a workout, and the views of the Valais Alps compensated us squarely for our reduction in power. 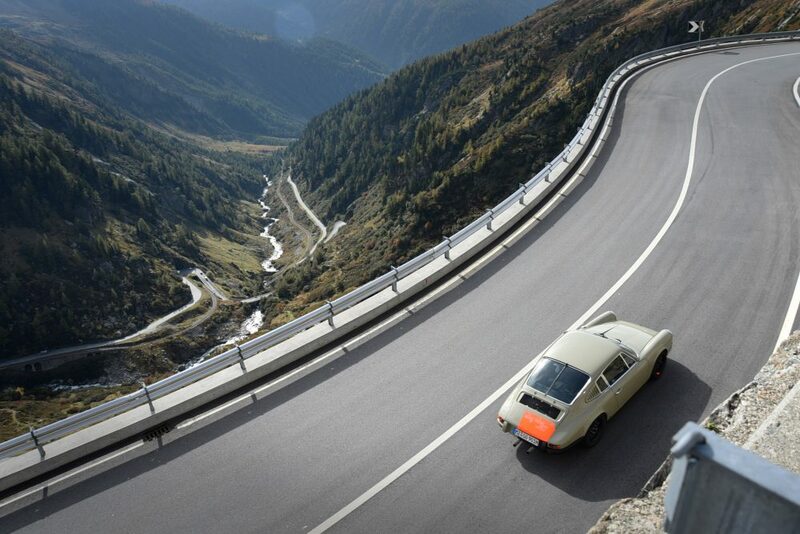 We go along like this for some time, and then we cross the border into Italy. 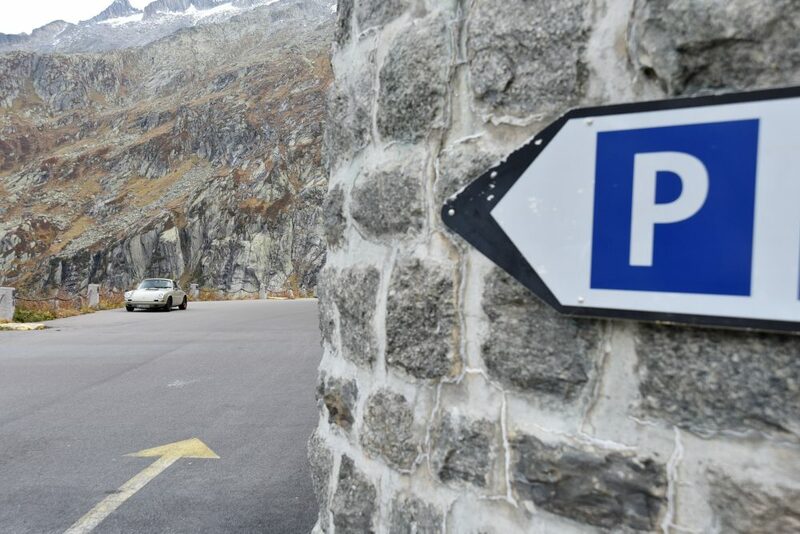 In Domodossola, we turn off towards Santa Maria Maggiore, where a stop for lunch is in order. 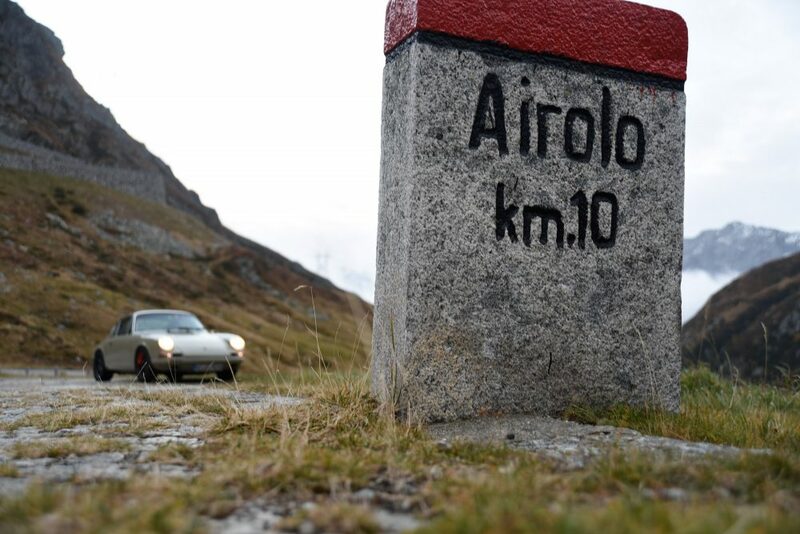 After a nice meal at a local pizzeria, we take off again in the direction of Cannobio on Lake Maggiore, and the road funnels down to almost a single lane’s width as we make our approach. 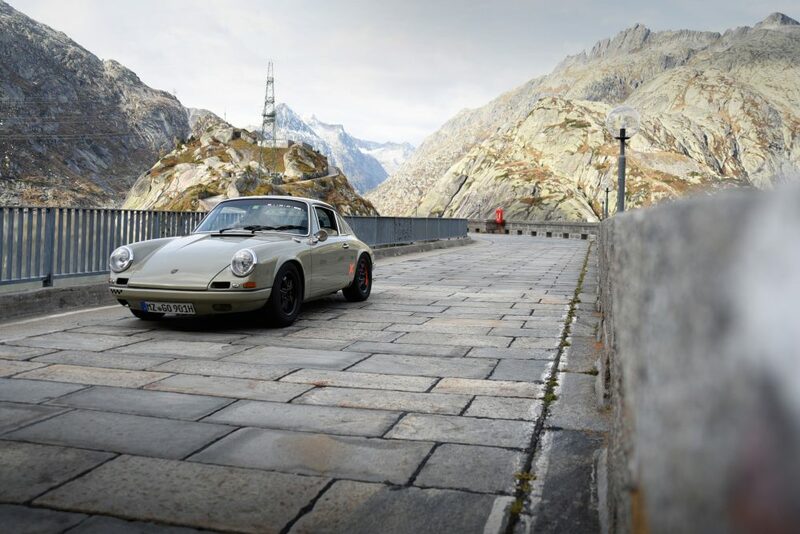 I had to use the emergency brake a few times given how tight some of the turns were, even thought the S brakes I have on the car do their job more than well enough. After being squeezed out of this road and now traveling lakeside, we stop for refueling—the 2.4-liter engine doesn’t have awful mileage, but driven spiritedly in this elevation, it empties the 85-liter tank pretty quickly. 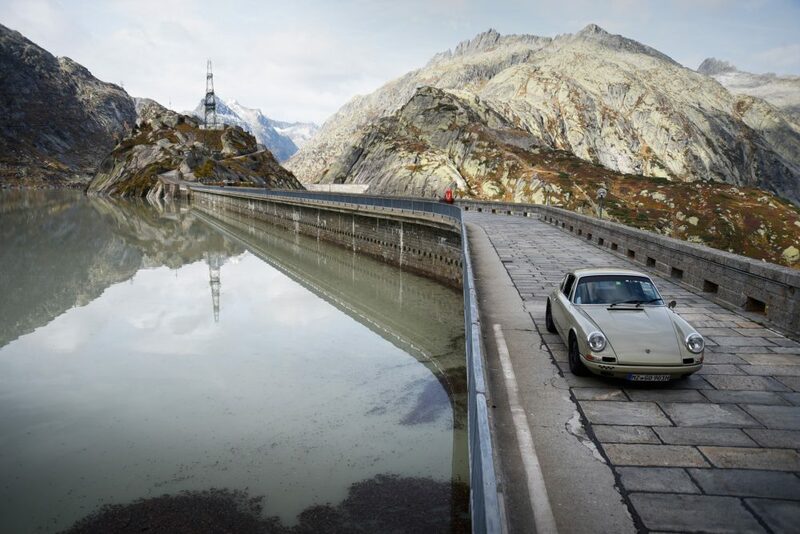 Seeing the needle on the gas gauge get dip towards empty is a bit stressful when you have no idea where the next petrol station will be and you’re up in the mountains! 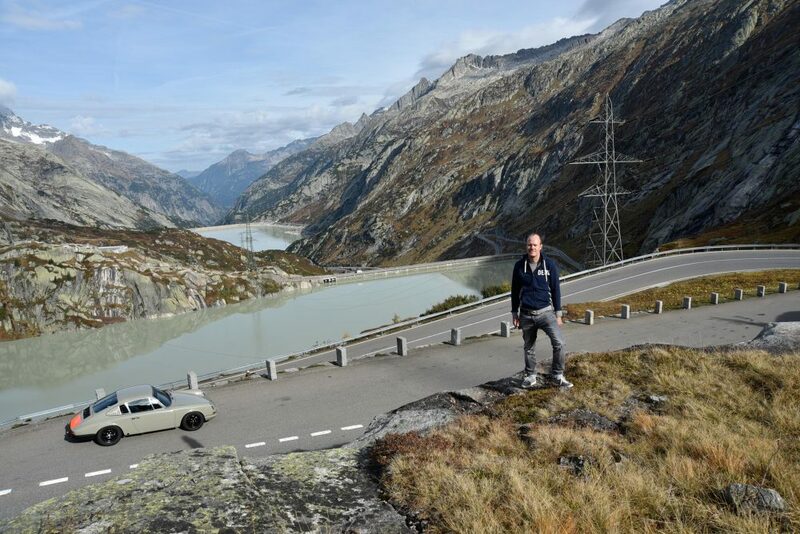 With the car now also fed, we continued our arc along the lake’s perimeter until we came upon our next landmark of our route: the Gotthard Pass. 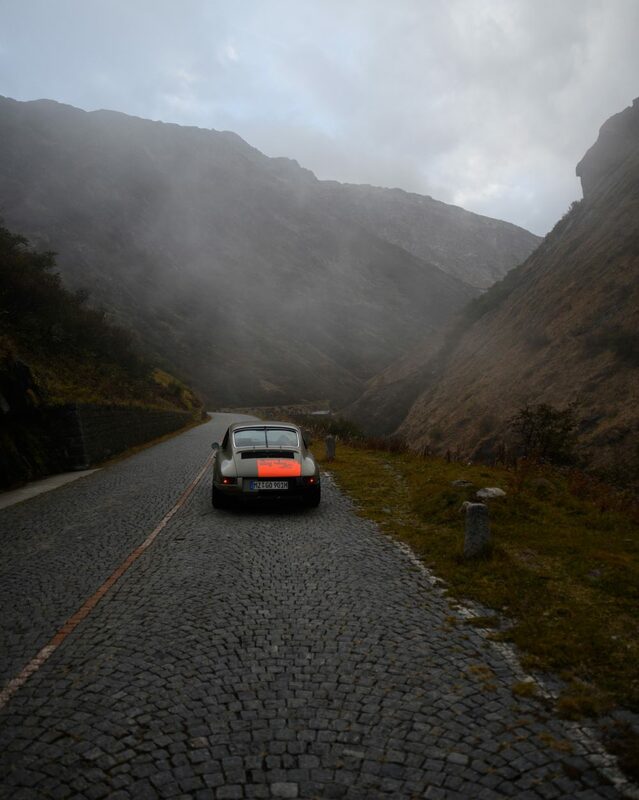 A particularly spectacular piece of which is the old Tremola Road, which is cobblestoned and extremely curvy. 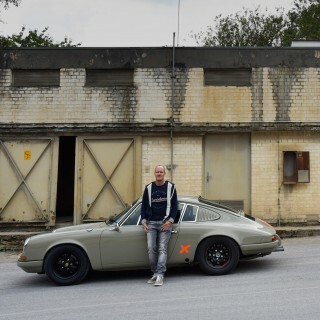 We took the 911 up and down this sector more than once given how empty the place was, and we used the opportunity to get some unobstructed photos here too. 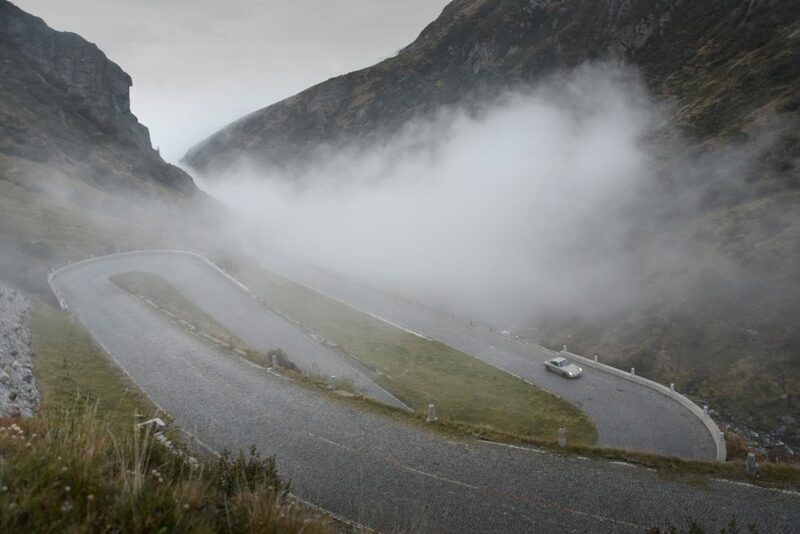 We eventually continued our forward progress, and along the Gotthard Pass we continually made our way into and out of the fog that rises up from the valley below, creating an overall very surreal driving experience I won’t soon forget. As is the fashion for this trip, we arrive at our hotel late in the night and utterly exhausted from the day that led us there. We barely had the energy to eat our röstis (fried grated potatoes) before falling asleep. 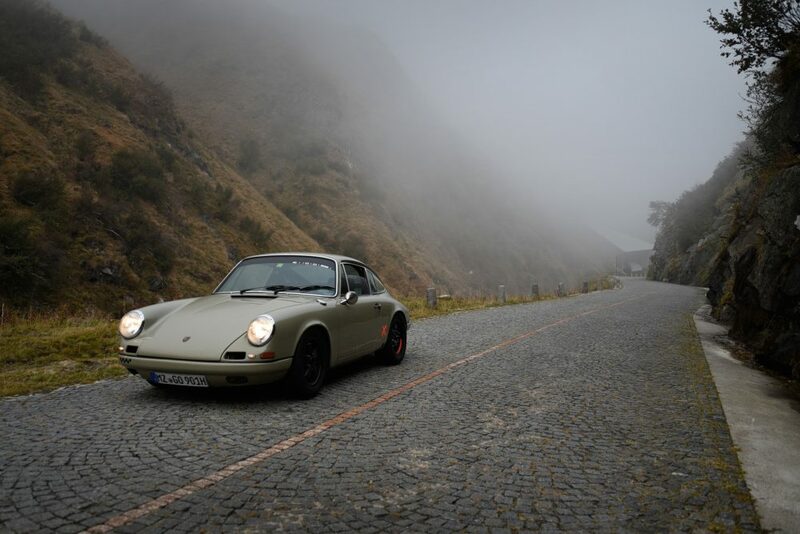 The next morning starts foggy on the Gotthard, but as we drive a few kilometers around a few corners, the sun shines as if it had never left us. 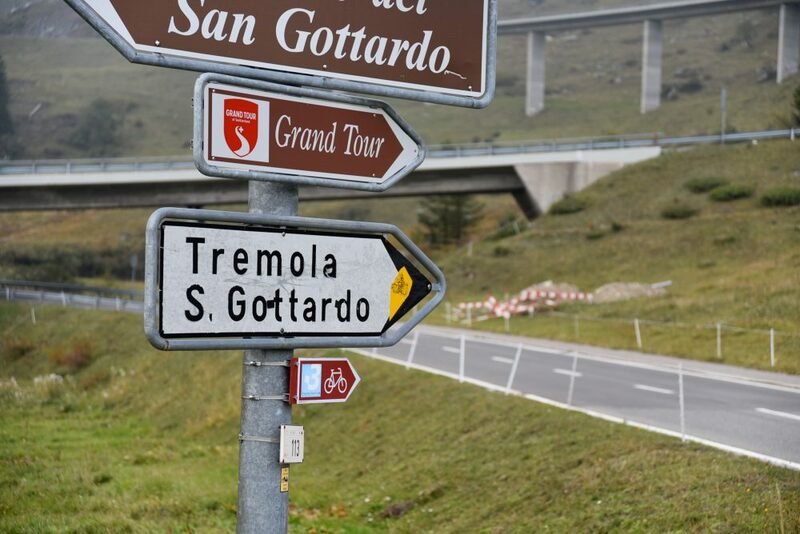 The route then goes over Furka Pass, the peak of which is 2,436 meters. 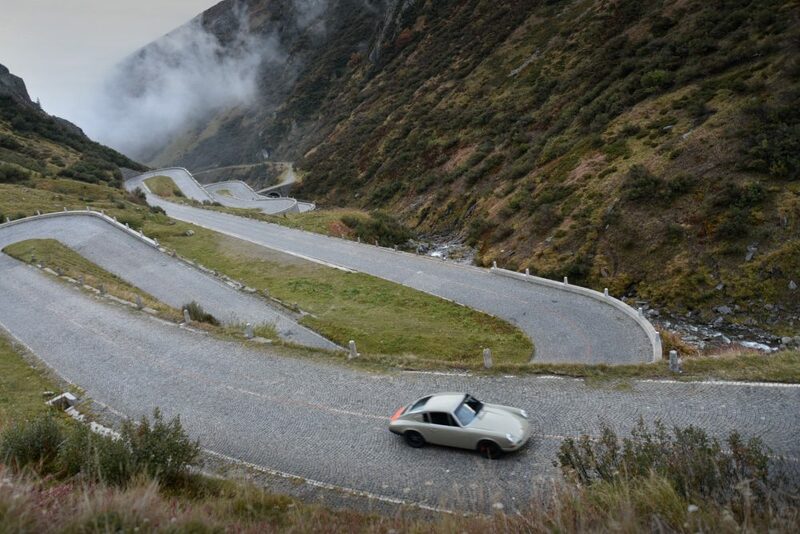 Again, the Porsche has to fight with the altitude, but it makes it up the ascent anyway. 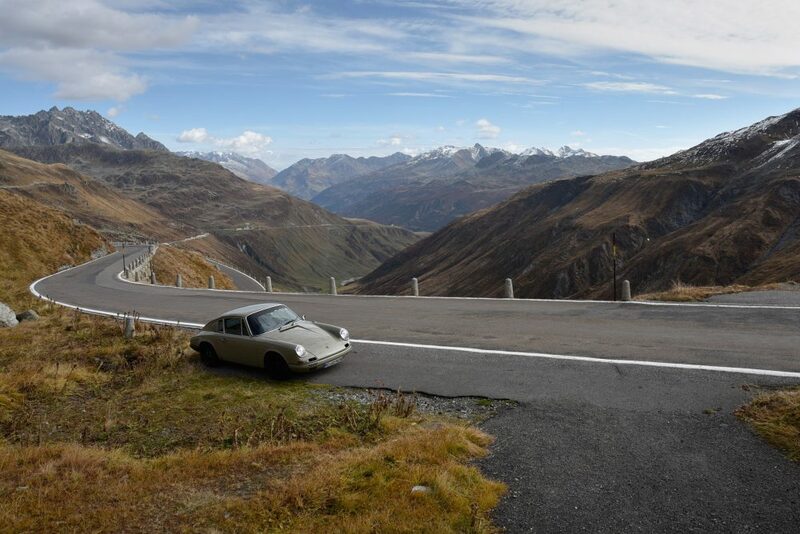 After this section we pause for a few moments in the parking lot they’ve placed up here, and we chance across two English Porsche fans and their 911 SC. 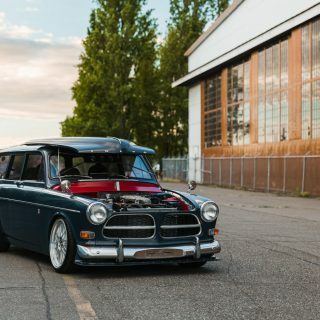 It turns out they recognized our car from the last Petrolicious article on it, and we had a nice chat with them before continuing on our way. 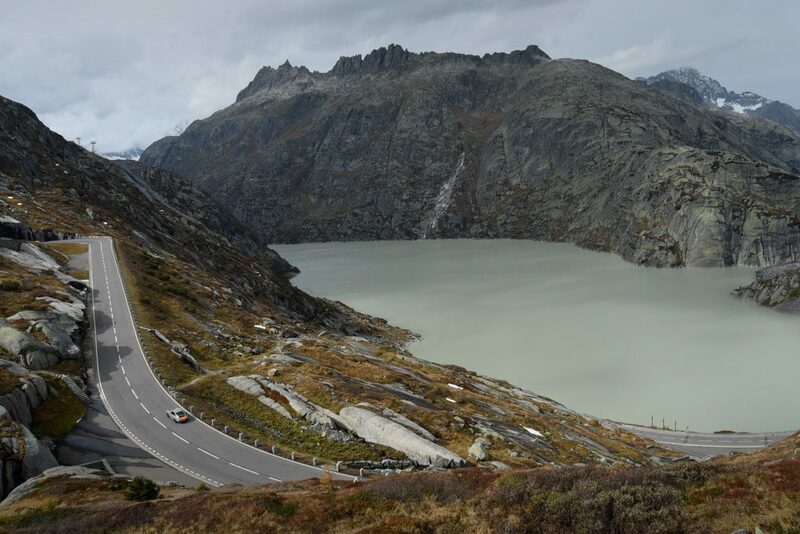 At this point we transition to the Grimsel Pass, and head in the opposite direction as we make our winding way toward Bern, where we will visit a friend before making the trek back to Germany and real life the following day. In all it was a wonderful trip. 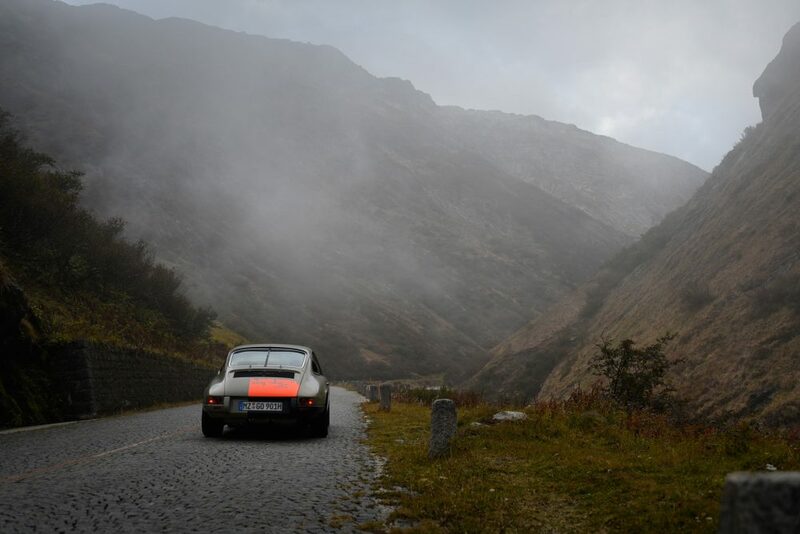 I had great company to share the views and food and road with, and being up in that other world in the mountains was the perfect inaugural adventure for my 911. 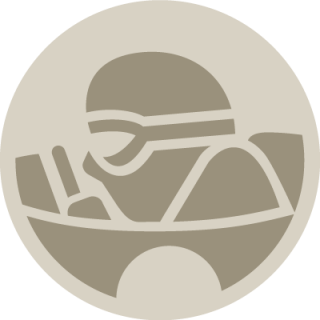 Now as winter fast approaches, we will take the time to fix and tweak a few things on the car, continuing along its path of improvement. 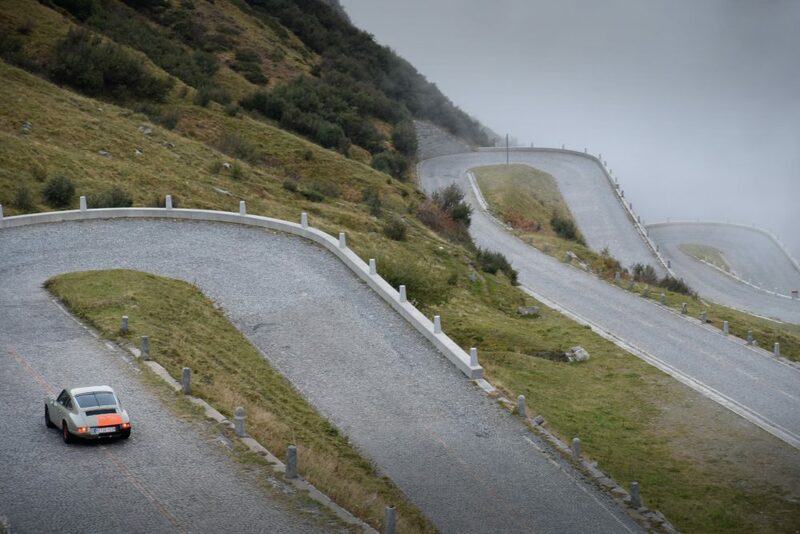 If all goes to plan, next year will be rife with more journeys like this one. 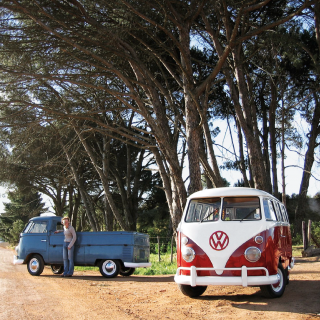 Even though it hasn’t even started snowing yet, I cannot wait for the arrival of spring! 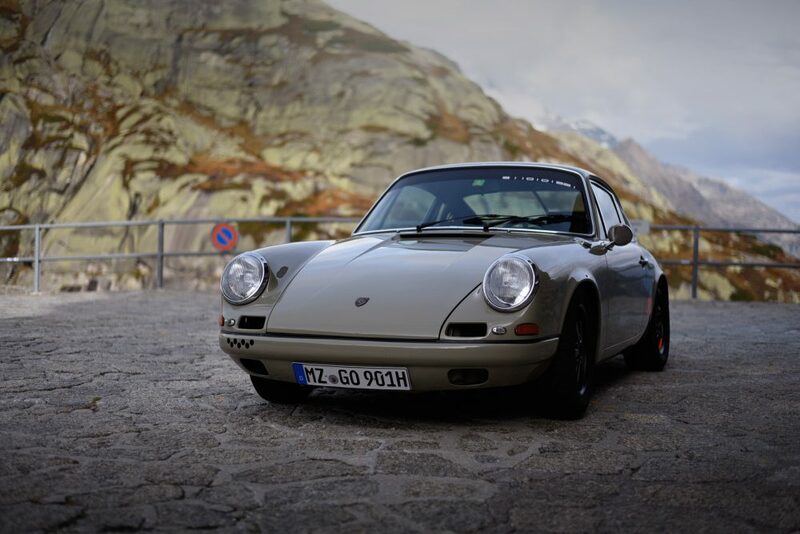 Hi, I really liked the history of your 911 Porsche, I wanted to ask you, you indicate that the color you used is a gray stone 7510 you could tell me the paint brand. Hi from Santa Monica! 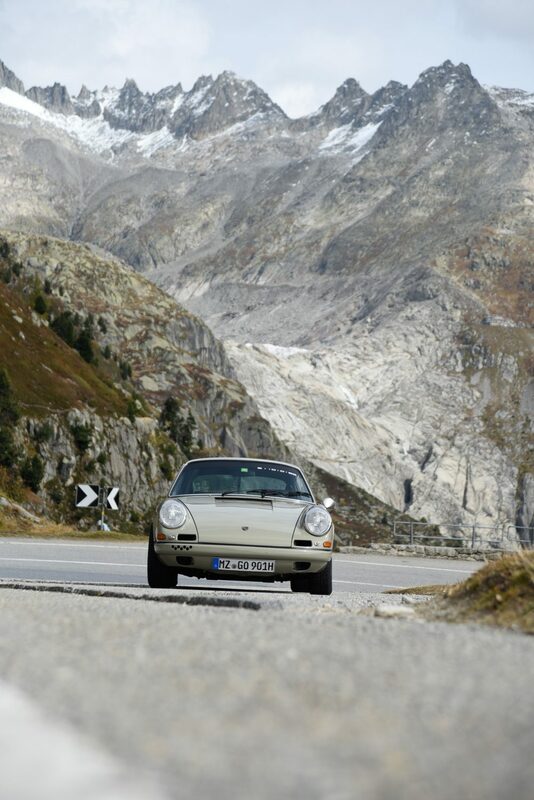 What a gorgeous part of the world and your Porsche fits right in. 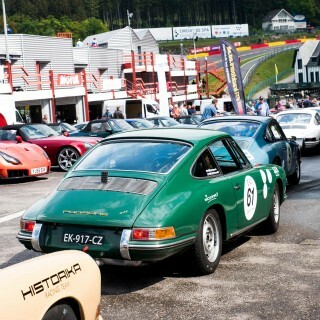 Kind of makes Mulholland look a little small. Btw, I’m old enough to remember when beach parking was 25 cents! Thanks for sharing.